37 mm 66-K6 х 2 pcs. Lazo — Soviet promo premium Tier VII cruiser. One of the light cruisers planned for construction under the "Big Ocean-Going Fleet" (project 68). 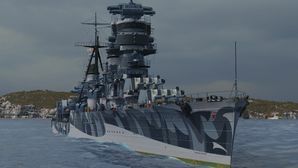 The ship's large dimensions allowed her to accommodate twelve 152 mm main battery guns and provide quite strong armor protection.